Hanagodu: Gajapayana, the traditional march of elephants from the forest, began at Veeranahosahalli Gate of the Nagarahole National Park in Hunsur taluk between 10 am and 10.30 am today at Tula Lagna, signalling the beginning of Dasara 2018. It will be the first Dasara for JD(S)-Congress coalition headed by H.D. Kumaraswamy. The elephants will arrive in Mysuru today and will camp at Aranya Bhavan (Forest Department office) in Ashokapuram till Sept.5 when they will be welcomed at the Mysore Palace at 4.30 pm. Earlier, the welcome was planned on Sept.3 (tomorrow) at 11 am but was put off due to the counting of votes cast for Mysuru City Corporation (MCC) scheduled tomorrow. The first batch of five elephants comprised Howdah Elephant 58-year-old Arjuna from Balle Elephant Camp, 62-year-old Varalakshmi from Mathigodu and 45-year-old Vikrama, 35-year-old Dhananjaya and 36-year-old Gopi from Dubare Elephant Camp. 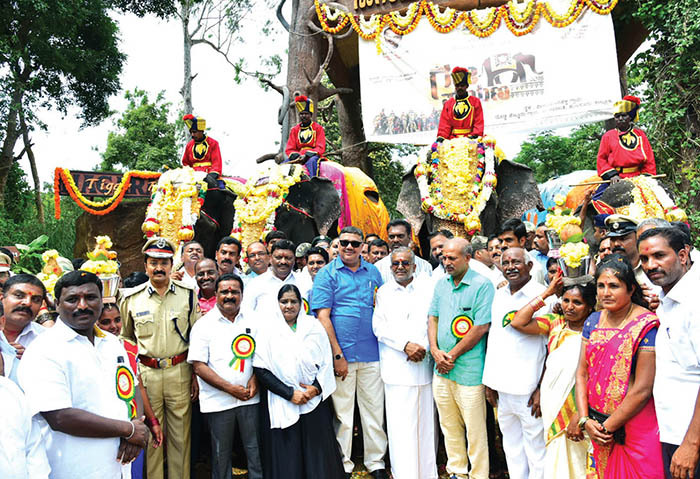 After the traditional start of Gajapayana, the elephants began their journey to Mysuru in trucks. 47-year-old Chaitra will join the team in Mysuru directly from Bandipur Tiger Reserve and she was not part of the Gajapayana today. 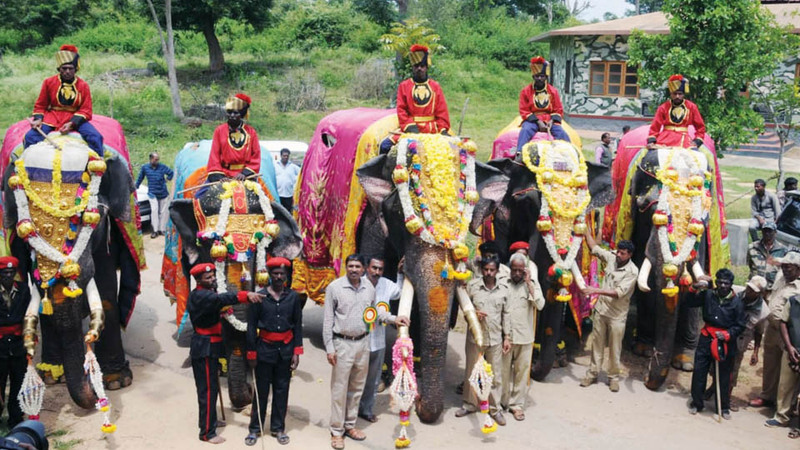 The elephants were brought to the Veeranahosahalli Gate at 8 am and they were bathed and decorated. Along with the elephants, mahouts, kavadis and their families too have started to Mysuru. A puja was performed at Sri Ganapathi Temple at the Veeranahosahalli Gate before inauguration. Higher Education Minister G.T. Devegowda, who is also the Mysuru District Minister, showered flower petals on the elephants, signalling the beginning of Gajapayana. Tribal couple Puttaiah and Thayamma lit the traditional lamp. Tourism Minister S.R. Mahesh, MLAs A.H. Vishwanath, Tanveer Sait, Ashwin Kumar Mahadev, B. Harshavardhan, MLC K.T. Srikantegowda, ZP President Nayeema Sulthana, Southern Range IGP K.V. Sharath Chandra, Deputy Commissioner Abhiram G. Sankar and other dignitaries were present. Over 2,000 people had gathered at the Veeranahosahalli Gate. Special cultural programmes were organised where youth and children from the Tibetan Camp at Gurupura near Hunsur presented their traditional dances. 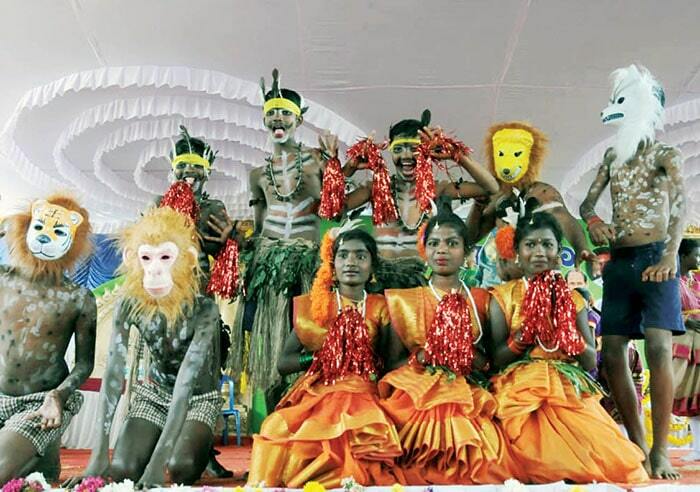 This apart, tribals from Veeranahosahalli and surrounding areas also presented their culture in a colourful way. With the Vijayadashami procession scheduled on Oct. 19, there will be 44-day period (assuming that the training will start on Sept. 6) for the Dasara elephants to train and acclimatise to city weather, traffic and people. Earlier, the training period were for 50 to 60 days but this year, it has been reduced to 44 days, thanks to Kodagu floods and the MCC elections owing to which the Gajapayana that is usually held in August has been postponed to September. The second batch of elephants is expected to arrive in a fortnight and the challenge for the Forest Department officials, mahouts and kavadis is to train over 12 elephants for the grand finale.